Finally, the one we’ve all been waiting for: our very own Duke Blue Devils. The Good: This is Duke’s biggest team of the decade. Boasting a starting lineup with an average height of 6’7″, Coach K finally has a legitimate froncourt. This will allow Preseason ACC Player of the Year and First Team All-American Kyle Singler to finally move to his natural position on the wing. Zoubek and the brothers Plumlee will rotate at the 5, with Thomas and Kelly filling in as combo forwards. Lance and Ryan are solid ballhandlers; LT showed the ability to drive baseline and finish in the Findlay game, a new skill in his arsenal. Scheyer is a sublime player, possibly one of the most trustworthy leaders Coach K has ever had. He’s calming, even when flashing the Scheyerface. 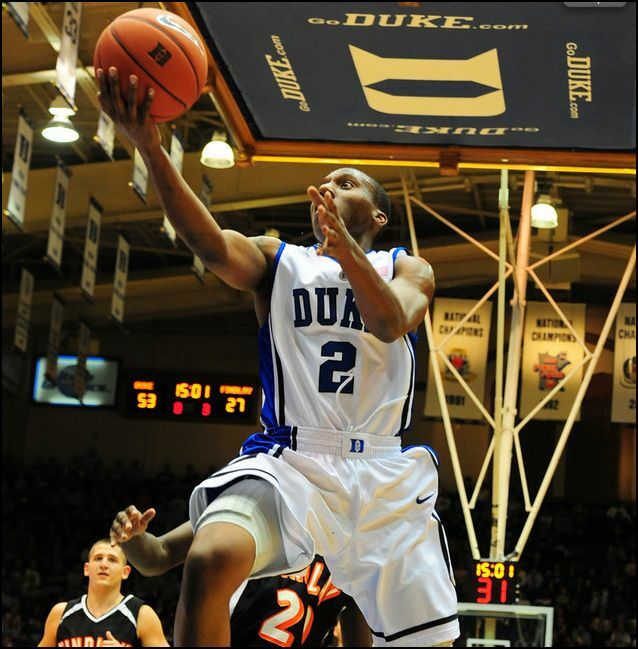 Nolan Smith’s improvement appears to be substantial, and he should step into his central role with confidence. He’s been in the lab, creating that monster. His legendary Twitter says so. The Bad: We’re not going to buy into the “lack of a true point guard” spiel – but we should talk about the relative dearth of ballhandlers. Scheyer has proven to be extremely efficient at the point, averaging nearly a two to one assist to turnover ratio last year. But depth in the backcourt may prove to be an issue. The early departures of Henderson to the NBA and Williams to Memphis obviously hurt. While Singler can handle himself on the perimeter, only having three scholarship guards in Scheyer, Smith, and Dawkins on the roster may haunt Duke when it counts the most. Coach K noted in a talk with the Crazies that this team’s length is much more pronounced that its quickness, a complete reversal from the guard-heavy teams of the past few years. Can this bigger and longer squad adapt to zone play? Will they be able to contain quick guards for 40 minutes? We’ll have to wait and see. The Crazie: Many fans have focused on “what could have been” this season. The departures of Gerald Henderson and Elliot Williams sting, and many YouTube aficionados lament the miss on John Wall. But look: we will finally see what Kyle Singler can do in the spotlight. He is the clear star on this team, and if the exhibition games are any indication of his play this year, Kyle will be a statistical monster—points, rebounds, and three point shooting in particular. Expect Singler to have a breakout year, and perhaps put himself in position for a high pick in next year’s (loaded) NBA Draft. The Bottom Line: This is certainly a talented team. Coach K called it the best group of guys he’s had since the ’04 Final Four squad. (Ah, Daniel Ewing, come back!). But the lack of guards leaves us in a precarious position, and this squad can’t afford injuries or bad stretches of play from the “big three” of Scheyer, Smith, and Singler. The first two games without Nolan will test Andre Dawkins, but hopefully he’ll come into his own à la Elliot Williams as the year progresses. Coach K will have legitimate scoring threats down low in the Plumlee brothers for the first time since Shelden Williams. If all parts work in concert, and we avoid the injury bug (knock on wood), look for Duke to get beyond the round of 16, and squash the rumors that our program is slipping.